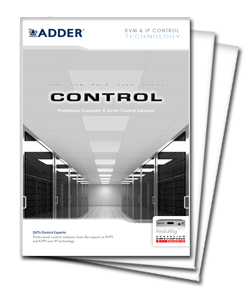 The AdderLink IPEPS ("IP Engine per Server") KVM over IP concept delivers a complete, secure, non-blocking approach to computer management. IPEPS is a powerful and flexible KVM-via-IP gateway that enables computer access from anywhere in the world, securely and remotely via the Internet or corporate network. The unit uses Real VNC client software and Adventiq Inside on-chip KVM over IP technology that is specifically designed for secure and extremely high performance KVM via IP applications. The AdderLink IPEPS delivers a non-blocking global solution by providing each computer with a dedicated KVM-over-IP gateway for enterprise KVM solutions. This can be enhanced by using the ADDER.NET Enterprise management software that provides a centralized and secure user access management interface. Where a KVM switch exists without KVM-via-IP functionality, the AdderLink IPEPS is ideal for adding global management capabilities. Increasing numbers of computers are being used in remote, stand alone applications such as ATMs and digital signage devices. The unit's incredibly small palm size makes it perfect for remote management and control of dispersed computers, meaning that many tasks that would have required an expensive site visit can now be done from anywhere. Enterprise grade security using AES 128 bit encryption and RSA 2048 bit public key authentication, with added encryption of RealVNC. IPEPS enables you to remotely access and control your computing hardware remotely using your standard IP network (WAN or LAN) via a web browser. IPEPS also acts as a RealVNC server with RFP 3.3 support, that can be accessed via Real VNC client software. Unlike software based solutions, the AdderLink IPEPS gives full control of a computer even during boot up, BIOS level or computer crash states. The AdderLink IPEPS will work even if the controlled devices are not operational. Increasing numbers of computers are being used in remote, stand alone applications such as ATMs and digital signage devices. The AL-IPEPS incredibly small palm size makes it perfect for remote management and control of dispersed computers, meaning that many tasks that would have required an expensive site visit can now be done from anywhere. 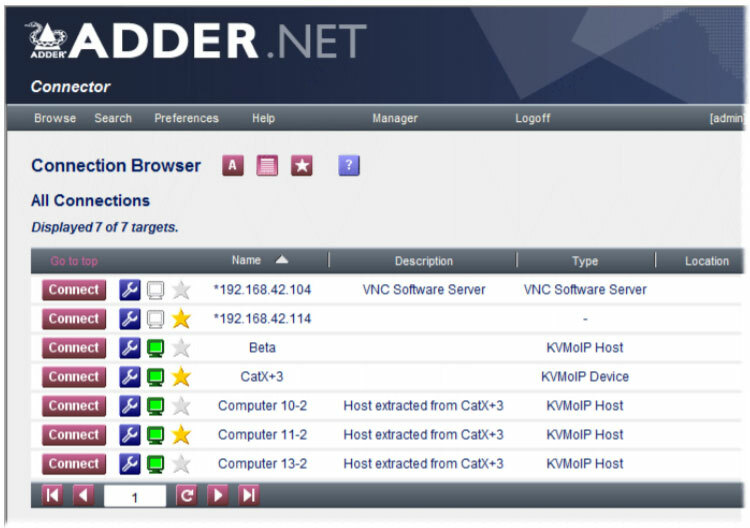 The free ADDER.NET Enterprise Management Software provides a centralized, secure and intuitive user access management interface, where up to sixteen user profiles with defined access rights can be created. Each user station can be granted different access permissions on a per computer basis including View only, Shared, Exclusive or Private. The AdderLink ipeps can use a standard web browser (up to 1280x1024), or for superior graphical performance (up to 1600x1200) Real VNC can be used. Free of the limitations of HTTPS, Real VNC greatly enhances video performance. IPEPS is engineered to act as a conduit through which data can be passed so that files can be transferred via IP onto the target computer by means of a USB virtual media port. Make any KVM switch remotely accessible! Adder IPEPS an be used as a front end for almost any Adder or third-party KVM switch. This allows access to your KVM switch remotely over IP - essentially making any standard KVM switch device a KVM-Over-IP switch. Four extended remote users can simultaneous access each IPEPS unit. With 16 definable seperate user profiles, multiple IPEPS units can be used to create an extensive IP-based KVM switching matrix using only individual access points. Adder IPEPS units have built-in security measures compliant with universal enterprise grade security standards, inlcuding AES 256 bit encryption and RSA 2048 bit public key authentication, further enhanced by the use of Real VNC that allows for the creation of ciphered user communications. Adder IPEPS supports all known software and computer platforms with PS/2, USB and Sun keyboard and mouse interfaces, including Windows (all), DOS, Linux, Unix, BSD, Sun OS, Solaris, Mac OS, NetWare, etc. Adder IPEPS can be powered from two USB cables, or independently from an optional external 5V power source. 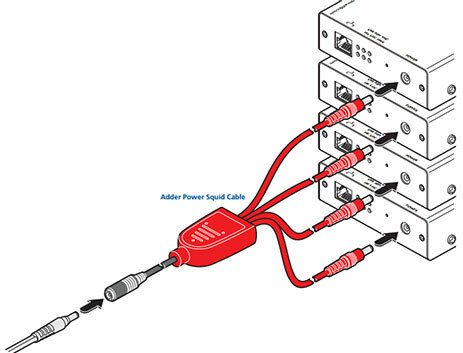 Alternatively, the Squid Power Cable (CAB-XSERIES-4WAYPWR) also allows up to four IPEPS units to be powered externally from a single power adapter. An optional chassis (X-RMK-CHASSIS) allows up to 16 (AL-IPEPS) or 8 (AL-IPEPS-DA) units to be housed in 2U of rack space. Sun and Mac. USB or PS/2connections supported. iPEPS is also known as AL-IPEPS. Question: What is the meaning of virtual media support? "Allows an authorized remote user to transfer files and folders to a host computer, such that they appear as though presented locally on removable media (as would a memory stick, CDROM or floppy). Via the IP network link, the remote user can then control the host and make use of the transferred files and folders. An indispensable feature when remotely upgrading or patching distant host systems." Question: Does this device support WOL? Question: Does this provide BIOS level access to a server? Answer: Thank you for your inquiry. Yes, this unit will provide BIOS level access. From the Adder website: "Gives full control even during boot up, BIOS level or computer crash states. The ADDERLink ipeps will work even if the controlled devices are not operational." Answer: Thank you for your inquiry. For KVM over IP functionality, you would only need one switch connected to the remote machines. Access is through a separate computer, typically using a browser window, over LAN, WAN or even the internet and can route through any number of switches. The latency will greatly depend on the network and video signals that are being sent, but in general the delay is relatively short. For a single remote computer, you may be interested in an IP gateway rather than a full switch. This particular Gateway (the Adder IPEPS) will support up to 4 simultaneous users, each on separate local computers, viewing the same information from the target computer. You can browse additional gateways here: https://www.kvm-switches-online.com/kvm-over-ip-gateways.html. Question: Does this unit allow local Monitor & KB/Mouse connections as well? The Adder AL-IPEPS does not include connections for a local console (monitor, keyboard and mouse); you would connect to the iPeps unit using a web browser. However, you may want to take a look at the Adder AdderLink IP Gold KVM Gateway, which does include connections for a local console. If you would like a recomendation based on your setup, please feel free to contact your KVM Switches Online sales reprasentative directly at 1-877-586-6654, at sales@kvm-switches-online.com, or via our online Chat functionality. Question: Adder AdderLink IPEPS KVM - Does this unit have a power control option available on it. We need to be able to turn a server on/off remotely. It does not. The best way to power a server on/off remotely is by using a stand-alone remote reboot unit (i.e. iBoot G2) or optional native Adder PSU-RED power supplies. You can use the Adder iPeps in combination with a remote reboot device like the Dataprobe iBoot to turn on or off a pc remotely. Alternatively the digital version of this IP KVM, the Adder ALD-iPeps also features a Serial RS232 port that allows communication to power switching devices, allowing remote rebooting of the target computer. Squid Power Cable for up to 4 ADDERLink iPEPS. Requires PSU sold separately.